Motorola's G series of phones may not have all the bells and whistles of top-range smartphones, but they doesn’t have the price tag of an iPhone XS or Pixel 3 either. Each member of the Moto G7 family feels designed to meet the needs of particular users, without breaking the bank, and in this regard they’re attractive devices. The Moto G7 Power is – the clue’s in the name – all about battery power. It’s able to last for days on end without charging, and in that regard it feels reminiscent of a brick phone of old, with trips to the charger a relatively rare occurrence rather than a daily necessity. It’s a phone for people who won’t have reliable or regular access to a charger, or who’ll be running demanding apps for long periods of time, and don’t need the most fantastic camera or hugely impressive specs. That said, the Moto G7 Power is a surprisingly capable performer for a low-end device; its processing power and chipset are nothing to turn the nose up at, and on paper its 12MP camera is impressive for a budget phone. The camera isn’t as powerful as its siblings, the G7, G7 Play and G7 Plus — but that’s the trade-off for its impressive battery. The Moto G7 Power is on sale worldwide, with a price tag of $249 / £179 (around AU$330). It comes in two configurations, and which one you can get depends where you live – it comes with 3GB of RAM and 32GB of storage in the US but 4GB RAM and 64GB internal storage in the UK. That price tag makes it the second-cheapest G7 phone – the G7 Play is even cheaper at $199 / £149 (roughly AU$280), while both the G7 and G7 Plus are a little pricier. 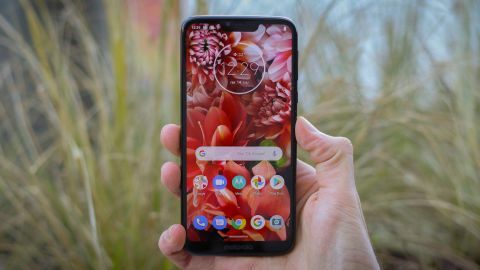 The Moto G7 Power sits comfortably among similar big-battery budget phones in terms of price, with the Moto E5 Plus costing $70 / £54 less and the Lenovo P2 costing around £25 / £20 more upon release (although the latter had a slightly bigger battery). The Moto G7 Power has a slightly better chipset than those two, however, as we’ll get into. The Moto G7 Power is a bulky device. Its 159.43mm x 76mm size, 9.3mm thickness and nearly 200g weight make it look and feel like a chunky handset – and it feels a little awkward to use because of it. If you have small hands it’ll be hard to reach all corners of the screen, and pulling the device out of a pocket or using it while walking feels a little more cumbersome than we’d like. The plastic back of the device doesn’t feel as impressive or protective as the Gorilla Glass of the G7 and G7 Plus, but at least it feels solid enough to be in no danger if you drop it. The Moto G7 Power comes with a thick plastic case too, for added protection, which does increase the size of the device but also provides it with some needed grip. If you’re new to Motorola’s phones you’ll find the placement of buttons and ports a little confusing, although fans of the brand will feel right at home. The volume rocker is above the power button on the right side of the device, which is distinct from the norms many phones follow, of having the power button above, or on the other side of the device to, the volume rocker. In addition, while we’re grateful it exists, the headphone jack is on the top of the device instead of the bottom, which is another annoying break from convention. The unconventional layout of the device makes it a little confusing to use if you’re not used to Motorola handsets, although this won’t be an issue for Moto fans. One unexpected bonus of the larger screen size is that the fingerprint sensor on the rear of the device is in a surprisingly intuitive location. While many other phones will require you to move your fingers to reach the sensor when you grip them, the scanner on the G7 Power is perfectly placed so that when you pick up the device your finger is already over the button. The screen is 6.2 inches, but unlike the G7 and G7 Plus, which have the same screen size, it only has a resolution of 1520 x 720 compared to their 2270 x 1080. The difference is only noticeable though if you compare the phones side by side, and it’s not an issue in day-to-day use. The G7 Power’s screen-to-body ratio is 78.65%. There’s a wide notch at the top of the screen, and as with many other Android phones notifications are shown alongside the notch – and as with those other devices this means you can only receive two notifications before the rest are hidden, which is a little annoying if you’re regularly bombarded with alerts. The Power’s bulky size and weight are perhaps its biggest disadvantage – as mentioned, we found the handset a little too cumbersome as a portable device, – but its size makes this a decent phone for playing games or watching video, as we’ll see later. However the display is perfectly adequate for a budget phone, and you’d be paying more for a similar experience from other brands.